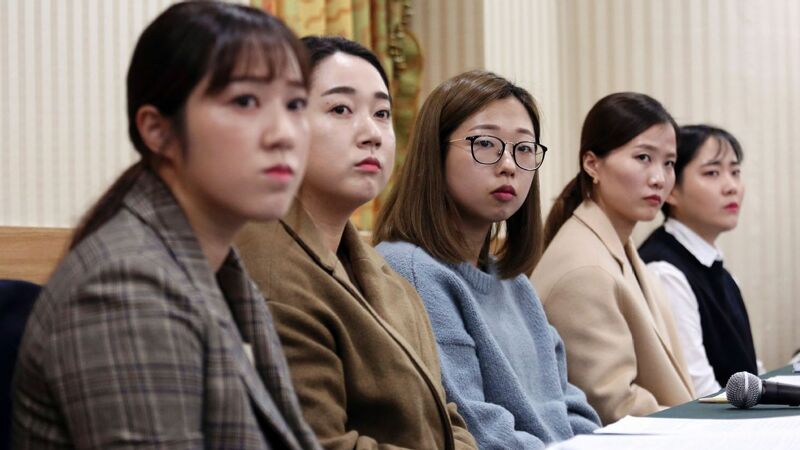 South Korea is planning a yearlong investigation into a culture of abuse in sports after several female athletes came forward to say that they had been raped or assaulted by their coaches. An athletes' group has raised further allegations of sexual abuse in South Korean speedskating following explosive claims by two-time Olympic champion Shim Suk-hee that she had been raped by her former coach. Olympic speedskating great Viktor Ahn, who won six Olympic gold medals in his career, is retiring from the sport at age 32. U.S. Speedskating is setting up its coaching staff for the 2022 Winter Olympics, bringing back two familiar names after the program has struggled at the past two Games. Speed Skating Canada has fired national long-track coach Michael Crowe, four months after former American speedskaters claimed he had sexual relationships with athletes while a U.S. coach. Miho Takagi became the first Japanese woman to win the speedskating allround world championships after beating defending champion Ireen Wust in a thrilling 1,500-meter race on Saturday. Top favorite Lee Seung-hoon skated a masterful race to take gold for South Korea in the men's mass start at the Pyeongchang Olympics, while Japan's Nana Takagi blasted past the opposition in the final straightaway of the first women's mass start. The Americans went on an improbable run and beat powerhouses on their way to an Olympic gold medal in curling -- the first Olympic gold for Team USA in the sport. In what is believed to be his last Olympic appearance, speedskater Shani Davis warmed to the crowd after his race, but he then slipped away without a word. Should that come as a surprise? More than 567,000 people had signed a petition as of Thursday afternoon that called for skaters Kim Bo-Reum and Park Ji Woo to be expelled from the Olympics, after they left a slower teammate behind in Monday's women's team pursuit quarterfinals. Thursday's highlights in Pyeongchang include a Mikaela Shiffrin-Lindsey Vonn showdown in Alpine combined, while the U.S. takes on Canada in the women's ice hockey final. The U.S. women finally won a long-track speedskating medal at the Pyeongchang Olympics, ending a drought for the women dating to the 2002 Salt Lake City Games. Japan and Norway dethroned the Netherlands in the team pursuit Wednesday and restored a semblance of balance in Olympic speedskating at the Gangneung Oval. The South Koreans found success early in the sport and haven't looked back. The short track speed skaters are national sports heroes and the subject of great pride. South Korea won the gold medal in women's 3,000-meter short track in a penalty-filled race, with Italy earning silver and the Netherlands winning bronze. Tuesday's highlights in Pyeongchang: Canada's Tessa Virtue and Scott Moir look to win their second Olympic gold of the Games, the U.S. men's hockey team plays for a spot in the quarters and Germany's Laura Dahlmeier eyes a fourth biathlon medal.